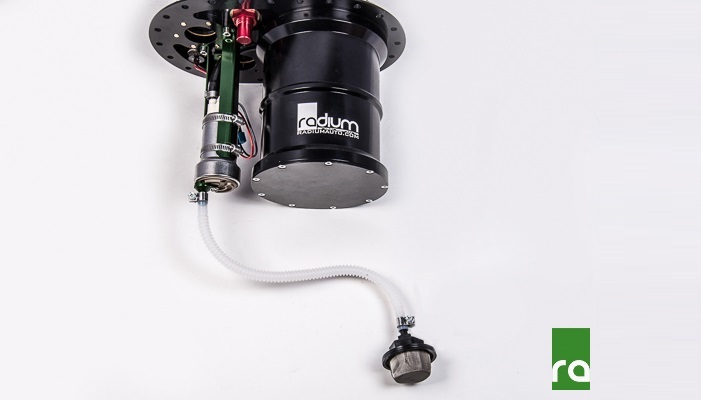 Radium Engineering has released a new ground-breaking Fuel Surge Tank designed specifically for use in EFI vehicles with competition fuel cells. The Fuel Cell Surge Tank (FCST) is the first drop-in anti-fuel starvation system. 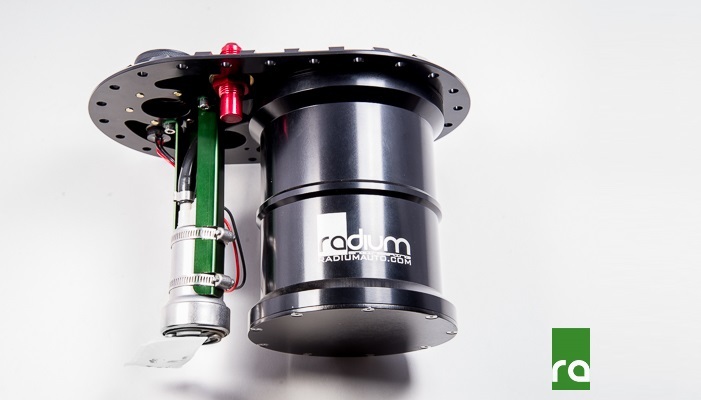 Radium Engineering’s multitude of externally mounted fuel surge tank variations has become increasingly popular in motorsports. However, installers can sometimes struggle to package them in the vehicle due to extra wires, hoses, and the lack of space. After receiving feedback from builders and race teams, Radium decided to explore a surge tank that resides inside the fuel cell. 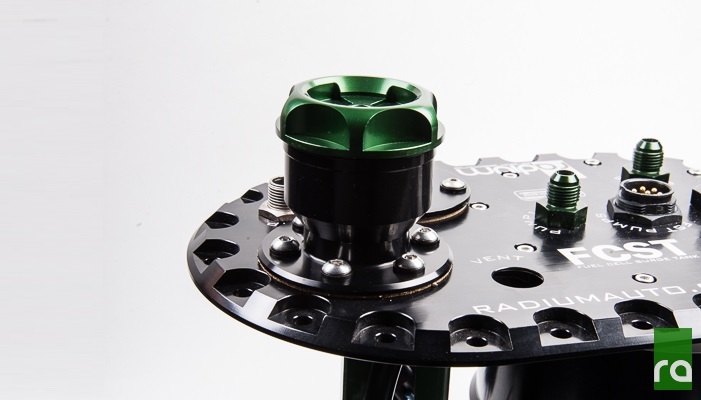 Working in Radium’s favor was the 24-bolt 6″x10″ oval flange found on most popular fuel cells. The flange bolt pattern is an industry standard based on aircraft fuel bladders. Making a surge tank that could interface with this flange style would allow it to work in many different industries. Research revealed several fuel collectors that are available to help with scavenging fuel but no true internal dual-chamber fuel surge tank systems existed in the market. Testimonials from race teams also revealed many weaknesses in current fuel pickup aid devices. The Radium FCST uses a lift pump (shown above) to transfer fuel from the main fuel cell chamber into the integrated 2.2L surge tank. Once filled, passages in the underside of the FCST fill plate allow excess fuel to overflow back into the main fuel cell chamber. 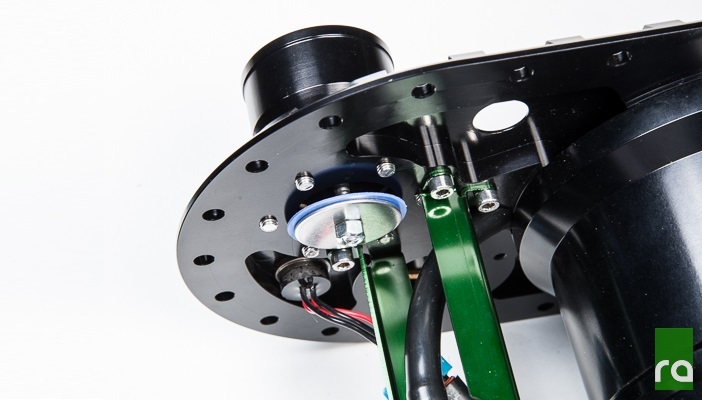 The lift pump is adjustable in height to accommodate fuel cells between 8″ deep and 11″ deep. For deeper fuel cells, see section below. 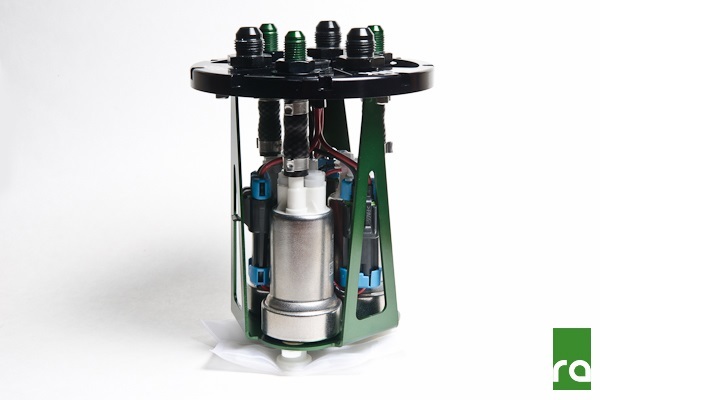 Inside the surge tank, up to three internal 39mm-style fuel pumps can be used. This is identical to how the tried and true Radium Multi-Pump FST works (shown above). These surge tank pumps supply the engine with high pressure fuel. Each pump has dedicated wiring through a bulkhead connector as well as a dedicated -6AN output port. As depicted above, the lift pump also has its own dedicated electrical bulkhead connector. The FCST fill plate is compatible with all popular fuel cell accessories including a vent valve, fill neck, and fuel level sensor (block off plate included). A fuel pressure regulator will route low pressure fuel directly back into the surge tank through the “Return” port keeping it full. 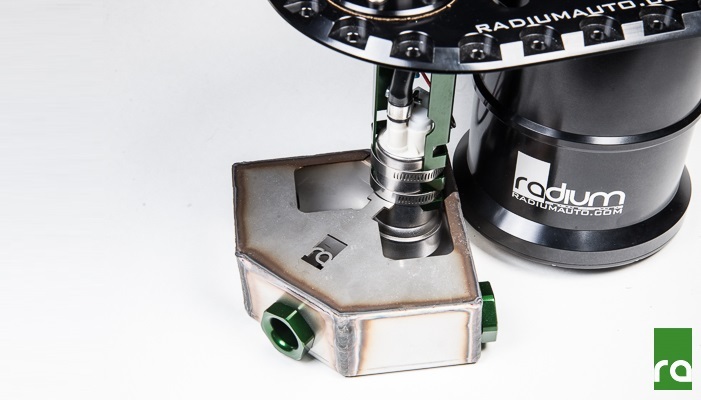 In order to provide the most flexibility, Radium offers a Fuel Cell Fill Neck (sold separately) that can serve either as a remote-fill connection with the rollover flapper valve (shown above) or as a direct fill point with a screw-on cap used (shown below). 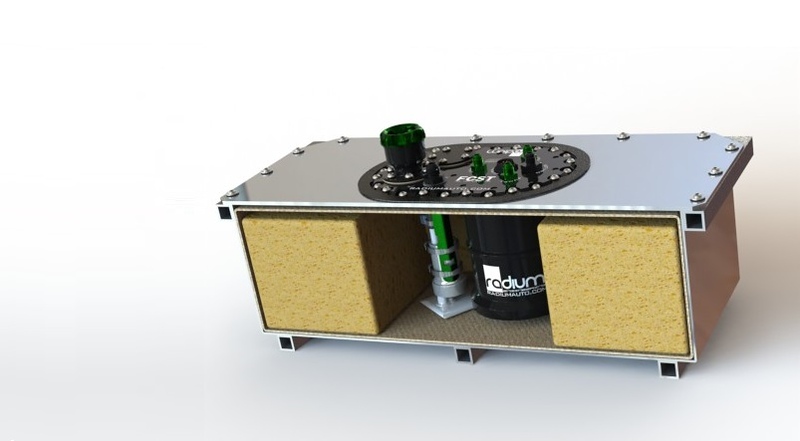 In order to further improve fuel scavenging, Radium also offers an optional Fuel Collector Box (shown below). This stainless steel box uses 3 billet aluminum high-flow check valves to trap fuel inside and keep the lift pump supplied with fuel. The box is held in place inside using the anti-slosh foam commonly found in fuel cells. If the FCST is installed in a fuel cell deeper than 11″, several options are available to ensure the lift pump picks up from the lowest part of the fuel cell. The image above shows the optional Fuel Pump Inlet Adapter kit with pickup hose. This kit adds remote pick-up capability for pumps that are normally designed to rest at the bottom of the fuel cell/fuel tank. 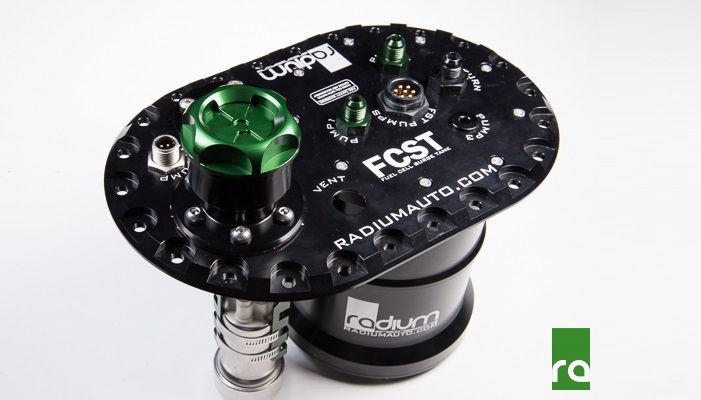 The Radium FCST includes a Fuel Cell Mounting Kit that distributes the weight across the entire fuel cell, as depicted above. Once installed, the FCST creates a clean package without losing extra space in the vehicle. 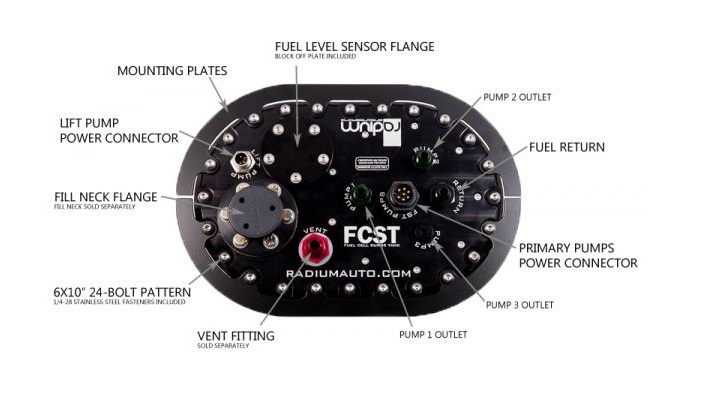 The FCST has already been tested in extreme motorsports including professional drifting and rally racing.